The Annotate function allows you to add notes, drawings and zones to your animation and these can be set up to appear and disappear at a time of your choosing during your animation. 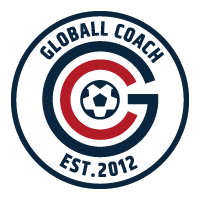 Press the Annotate button at the bottom of the Globall Coach screen to go into the Annotate function. Press the area of the pitch where you want text to appear. Type your text in the box that pops up and then press Save. Use the circle at the bottom right of the text box to resize it. To delete a text box press the Delete button. Select the tool you wish to use. Draw the item in the area of the pitch you would like to see it. Select move.The timeline will be shaded red to indicate the portion of the timeline the item will appear. This can be moved. This can be shortened or extended using the sizing handles at the ends of the shaded area..
Press on the pitch and hold down to drag the zone to the size you wish it to be. Select anchor point and press Delete.